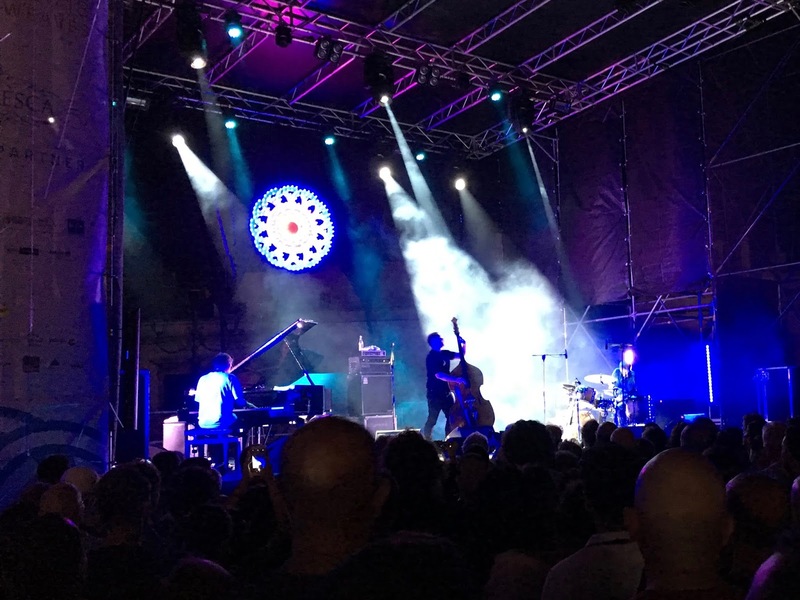 After last year's very enjoyable Locus Festival 2017 we were interested in this concert but were not sure if we'd make a Sunday evening performance after a midday Aperitivo Classio followed by lunch with friends which is usually fairly boozy. Our friend Kathy who used to live here said "You must" and "If I were there I'd drag you along", she being a fan of GoGo Penguin. In the end I *was* restrained so I could drive Mary and I over to Locorotondo that evening armed with two folding picnic chairs. And very glad we were that we went; it was an excellent concert and all free! The support act, T-Riot, are a local trio playing mellow jazz. A well thought out compare-and-contrast choice to support the main act. Jazz Convention describe their music as, variously, "rhythmic exoticism", "docile and sensual" or "nostalgic and filmic. GoGo Penguin are an English trio from Manchester. A little more avant-garde jazz than T-Riot but easily this side of listenable; very accomplished musicians. "The band's music features break-beats, minimalist piano melodies, powerful basslines, drums inspired from electronica and anthemic riffs. They compose and perform as a unit. Their music incorporates elements of electronica, trip-hop, jazz, rock and classical music. [Wikipedia]. Headed over to the merchandising booth and bought two CD's, one from each group which have been listened to multiple times since with great pleasure.